Scorching through Germany, Jonathan A. Stein makes tracks in AMG's Mercedes-Benz SL 60 while D. Randy Riggs hangs on tight enough to nail down the photos. Minutes before, I had been hurtling along at over 136 mph. After applying the huge vented disc brakes hard and pulling up absolutely straight, I was sitting in traffic next to scores of cars and diesel trucks. I couldn't believe the speed with which the hefty Benz had slowed or that I was in bumper-to-bumper traffic on the Autobahn. I expect to crawl for 45 minutes on the Santa Monica Freeway, but not on the road to Baden Baden. The big gray SL is fast-brutally fast. True, it tops out at 155 mph, but that's only due to electronic artifice. (Mercedes-Benz and BMW limit the top speeds of their cars to 155 mph.) "So," you say, "any SL500 or 600 is extremely fast and has the same top speed." But not like this one, brother. When AMG literature boasts that a husky two-ton carriage like this sprints to 62 mph in 5.7 seconds-Mercedes-Benz AMG Product Manager Mario Spitzner says that it's really more like 5.0 seconds (the SL600 takes 5.9 seconds to reach 60 mph)-you've got to wonder what makes it pull like a John Deere from the very beginning and like a Saturn V booster rocket all the way to the top end. 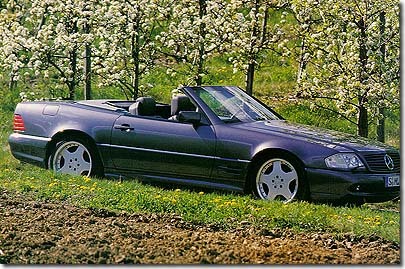 To the untrained eye, the SL 60 looks like any other two-seat luxo-roadster with the three-pointed star. The big clues are the huge 18-inch wheels wearing rubber with so little sidewall (40 series fore; 35 series aft) that they look like the wheel-tire combos from a slot car. If you're quick enough when the car flashes by, you may notice the AMG and SL 60 badges and the special dual exhaust outlets. However, the revised front and rear fascias and side skirting are so subtle and well-integrated that Spitzner isn't kidding when he says "only those who know will notice." In 1500 kilometers, one small boy and a single Porsche driver seemed to understand about the gray two-seater. AMG has been massaging Mercedes-Benz cars for 30 years. In the beginning, the company's "breathed-on" Benzes were a lot like their nickname, "the Hammer." Table manners were sacrificed for incredible speeds and handling at the limit. Back then, AMG was a tuner of "after-sale" cars. The firm's cars may have been faster and handled better than standard Mercedes-Benz automobiles, but the cars lost some of their polish and poise-as well as their factory support-in the process. And many traditional Mercedes-Benz customers would never have considered an aftermarket-modified car. 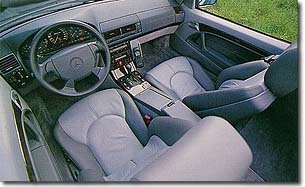 All that changed in 1990 when AMG and Mercedes-Benz established a formal business relationship. Although still independently owned, AMG is run as the high- performance and competition arm of the huge German carmaker. Spitzner, formerly AMG's Marketing Manager, insists that the smaller company is better-suited to moving quickly and creating niche models for every segment of the Mercedes-Benz product line than is huge Daimler-Benz. Now, though, the tuner has the full financial and technical support of the mighty German automaker. In the case of the SL 60, which has been produced at the rate of about 100 cars a year for the last five years, the car fills a "hyper-niche" above the standard SL500 and offers a more nimble and lighter package than the flagship SL600. And because the SL 60 and the other AMG models are full members of the Mercedes-Benz product line, they are sold and serviced by Mercedes-Benz dealers. As a result, sales of Mercedes-Benz AMG cars have climbed to 4000 cars a year. Some of these sales have come from repeat Mercedes-Benz customers and others have been crossover buyers who might otherwise have bought an M-series BMW. The SL 60 starts life as a partially-completed SL500 roadster assembled at the Daimler-Benz plant in Bremen and is trucked to the AMG facility in Affalterbach. The SL arrives with stock suspension, brakes, transmission and five-liter engine in place, although bumpers and body side-cladding are not installed. (The higher volume Mercedes-Benz AMG C36 and E 50 are largely completed on the lines at the Bremen or Sindlefingen factories.) Because of the standard SL's high level of interior equipment and comfort, cockpit changes are limited to an AMG steering wheel and a 300 km/h speedometer featuring the AMG logo. Once in Affalterbach, the suspension and brakes come off to be upgraded. In the case of the binders, ABS is retained and the SL500 discs and calipers are replaced with the heftier components from the SL600. When it comes to the suspension, changes are very subtle and are affected through subtle modifications and tuning rather than redesign. The five-liter engine is also removed, to be replaced by the new six-liter eight which was built on-site. Meanwhile, the five-speed automatic transmission is recalibrated to make the most of the greater torque and horsepower of the bigger engine. With the AMG sills and front and rear bumper in place, the final touches are the huge 8 X 18-inch front and 10 X 18 rear alloy wheels. They come from the same supplier as the standard SL wheels and are shod with huge Michelin Pilot tires. With the six-liter V12 already available in the SL600, why use a V8 of the same capacity? Spitzner explains that the SL 60 feels more sporting because it weighs 250 pounds less than the 12-cylinder SL and, thanks to the lighter engine, it carries less weight up front. The healthy four-cam, 32-valve V8 pumps out a conservatively rated 381 hp at 5600 rpm with a lower-than-standard 10.0:1 compression ratio. The massive 428 foot/pounds of torque peaks early at 3750 rpm-offering 8 lb/ft more than the V12 and a whopping 83 lb/ft more than the standard V8. Off the line, the SL 60 is scorchingly quick. But just when you expect the muscle to go away, it feels like a rocket booster cuts in and the power keeps on climbing until it peaks just 400 rpm short of the 6000 rpm redline. That translates into some of the most dramatic mid-range power delivery imaginable. There you are, cruising at about 80 mph on the autobahn stuck behind slower moving vehicles. When traffic finally clears or you want to get around that truck quickly, simply press the pedal. The transmission downshifts smoothly and you're slammed back into the big comfortable seat as the SL 60 accelerates like the space shuttle. That mid-range punch is so intoxicating that you just can't leave the pedal alone, which takes an incredible toll on fuel mileage in a land where $50 might just fill the tank-if you're careful. Under normal driving conditions, the engine is barely audible. Give it full boot, or cruise at sustained high speeds, which Spitzner calls "really flying low," and the engine and exhaust note become pleasantly audible, or what AMG calls "acoustically pleasing." Although the SL 60 is incredibly stable at well over 100 mph, when traffic backs up in yet another construction zone, it idles as smoothly as Aunt Helen's SL320 and never loses its cool with the air conditioning blowing away. At the same time, the carefully calibrated suspension provides a firm but incredibly comfortable ride over broken pavement, cobblestones and unpaved roads. 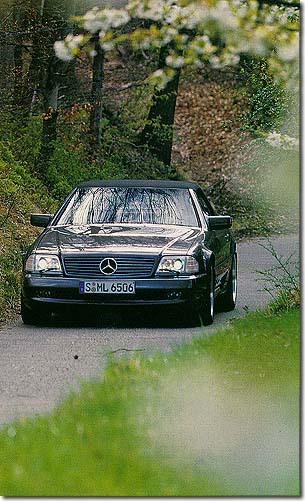 The big SL also held its own on the winding roads of Alsace, sweeping into bends smoothly and powering out quickly. However, its great width-an attribute of all Mercedes-Benz SLs-became disconcerting when winding through the narrow cobbled streets of 12th and 15th century Ribeauville, a wine center northwest of Colmar. Threading through narrow arches and crowds of tourists was not what any big car was made for. But the trip to and from the beautiful little village was what the SL 60 was made for and was just as gratifying as flying along the autobahn. The SL 60 proved docile in city or construction zone traffic and comfortable under all conditions, while remaining incredibly gratifying to drive. The full measure of the car is that there's never any indication that the SL is a "tuner" car. According to Spitzner, it is very important that "the car never looks or feels like it has been apart. " And, he cites the SL 60 as proof that "driving sporty doesn't have to be uncomfortable." For two years, Americans have been able to experience the gospel according to Spitzner through AMG's quick little C36, which was recently discontinued after a limited production run. But for now, Americans should give up any thoughts of mating an SL 60 and $1.40 a gallon premium fuel with a legal top-speed daylight run through Montana. But if you're ever heading for Baden Baden and get passed by a big gray Mercedes-Benz roadster running at the limit and blasting American rock-and-roll, it's probably Mario Spitzner "flying low" in an SL 60. But since you won't be able to catch him, you'll never know for sure.